Yesterday the author Dave Eggers was in Portland. I found out that he was going to be at Annie Bloom’s Books in the afternoon for a “meet & greet,” which is another way to say he would be chatting people up while signing his newest book for them. I wanted to meet him, and I knew he was scheduled to be at Powell’s Books in the evening, but I figured that would be kind of a mob scene, so I decided to go over to Annie Bloom’s. If you’ve never visited Annie Bloom’s, it’s worth the trip. The small, independent booksellers have been dying out over the past decade or so with Amazon price-fixing and e-books and so on. If you like books, and you like the act of perusing bookshelves, and if you like chatting with people who have a passion for, and know a lot about books, then go visit your local independent bookseller. It’s like buying a local bike, only cheaper. Alright, so Dave Eggers is one of my literary heroes. He’s got a journalism background, and he writes very human, accessible, and relevant stories -- both fiction and non-fiction -- about events that are taking place around us today. He seems to have his hands in a lot of different places, not only in the world of books. If you're not familiar with it, check out 826 Valencia, his youth writing project. And, check out McSweeny's publications. Writing can be so isolating and self-involved, but I feel like Eggers is out there in the real world, doing some good work. 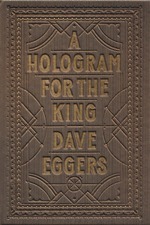 Eggers’s newest book, A Hologram for the King, is straight up fiction, whatever that means. But, as is Eggers’s way, the story is based in a reality that looks a lot like the one we have with us now. A middle class American entrepreneur is in Saudi Arabia trying to sell high-end technology to the king. I haven’t read it yet (just bought my copy yesterday), but one of the subjects in the book that I’m looking forward to reading about is the discussion of how America exported so much of its manufacturing overseas, and how this plays out in the story. I talked briefly with Dave Eggers about this part of the book, and he told me that in researching for it, he went to China and visited the factory for Flying Pigeon Bicycle Company, which has been around since the earlier days of Mao Zedong’s rule, somewhere in the 1950’s. Eggers had a translator and posed as a buyer, took notes and wrote a section for the novel based on his experience. But, unfortunately, ultimately, Eggers said that he had to cut a majority of that part out of the book. I’m still curious to know what Dave found out about overseas manufacturing, and how that plays out in his novel. And I wonder if I could convince him to let me read the section he cut from the final manuscript? Might be worth asking about.